The three Muslim families, including six children, had all lost their homes in bombings, the Vatican said. They were plucked from a refugee camp on the Greek island of Lesbos, where they have been stranded for weeks. They were chosen because they had their documents in order, not to make a political point to Europe about the need to better integrate Muslims, the pope said. 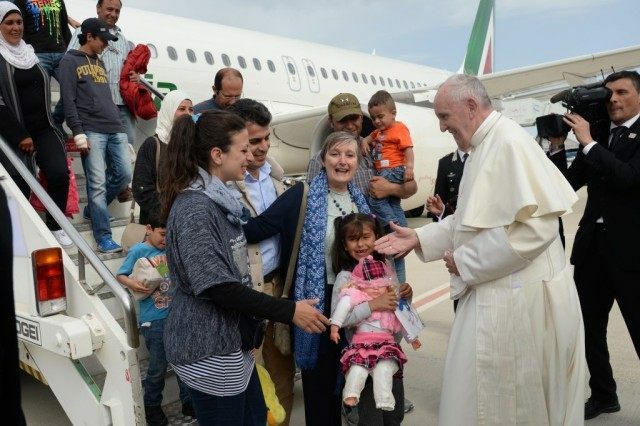 “Their privilege is that they are children of God,” Francis told reporters en route home to Italy after an emotional trip to Lesbos on Saturday. The Roman Catholic charity Sant’Egidio, which is providing the refugees with preliminary assistance, welcomed them at their headquarters in Rome’s Trastevere neighborhood late Saturday. The mothers were given red roses, and they were applauded as they arrived. Sant’Egidio released some details about the refugees but didn’t give any of their last names due to privacy concerns. Hasan and Nour, both engineers, and their 2-year-old son fled their home in Zabadani, a mountainous area on the outskirts of the Syrian capital of Damascus that has been heavily bombed. They headed to Turkey and took a boat across the Aegean Sea to Lesbos, like hundreds of thousands before them, hoping to reach Europe. But Austria and several Balkan nations shut their borders to refugees in early March, stranding more than 50,000 people in Greece. Ramy and Suhila, a couple in their 50s, came from Deir el-Zour, a Syrian city close to the Iraqi border that has been bombed by the Islamic State group. They arrived in Greece with their three children in February via Turkey. Ramy is a teacher, Suhila a tailor, Sant’Egidio said. Francis said his decision to bring the refugees to Italy was a “purely humanitarian” gesture and not a political act. Francis said the Vatican would take full responsibility for the 12 Syrians. He said two Christian families had been on the original list, but they didn’t have their documents in order. Speaking about his five-hour visit to the Greek island, Francis said he was particularly saddened by the trauma that the refugees’ voyages have had on the children he met Saturday. He showed reporters a picture that a young Afghan child had given him of a sun weeping over a sea where boats carrying refugees have sunk. “If the sun is able to weep, so can we. A tear would do us good,” the pope said. Hundreds of migrants have died in the Aegean Sea this year as the flimsy dinghies supplied by smuggling gangs sink or capsize. The pope cited Mother Teresa in responding to a question about whether his gesture of bringing 12 refugees to Italy would change the debate about Europe’s migrant crisis. “It’s a drop of water in the sea. But after this drop, the sea will never be the same,” he said.